In the final installment of Richard Schweizer’s blog series, he describes his vision for the future and why speaking out about schizophrenia is so important to him. For this, the last section of my blog I would like to convey the ups and downs of my life since being successfully medicated. I would also like to talk about my PhD research into schizophrenia. I hope that in telling you this story I may offer some hope for people with mental illness, and perhaps contribute towards a greater understanding of those that suffer, so often, in silence. It took me many months, perhaps years, to fully accommodate the fact that I had not only a mental illness, but perhaps the most serious of mental illnesses. I had fallen from a great height, and found myself with a new mountain to climb. The first grasping footholds in this mountain involved getting back into study (luckily my period in the clinic had occurred over the summer, when uni wasn’t sitting). I enrolled part-time to finish my Law degree at Sydney University. I managed to finish without too much difficulty, though I was still suffering bouts of depression and anxiety. Occasionally I would also be in class and things would well-up and get too difficult for me, so I would leave. In my final year of Law, I applied to do an exchange at a number of US universities. Luckily my old Honours supervisor from my Arts Degree days wrote me a fantastic letter of recommendation, and I was given a spot at New York University. I was off to The Big Apple! It had always been a dream of mine to live in New York – it’s such an exciting city – and here I was living my dream. The classes were tough, but I decided I would try my darnedest to get good marks. The city was wonderful. So full of life and energy. I had some close family friends there too, so every Tuesday night I would go to their place on the Upper East Side and have schnitzel. They invited me into their home with love, and I am eternally grateful. There is a story about the health system in New York I would like to relate. The medication I was taking, and still take, is a strong anti-psychotic called Clopine as I mentioned previously. In Australia, I need to have a blood test once a month to receive the drug. In the US the rules are a bit different. I needed the blood test every two weeks. So, in the first two weeks I popped into the hospital with a blood test request, got the results confirmed by a psychiatrist and went into a local pharmacy. I asked for two weeks worth of Clopine. The lady found the drug and said “five thirty-five”. I replied, “gee, that’s cheap! five dollars and thirty-five cents”. She responded, “No, five hundred and thirty five dollars”. I was blown away. I did not have medical insurance for schizophrenia as it was a pre-existing condition and I had to pay the full price of the drug. In Australia I get the same drug for forty-odd dollars, for a full month. Such was my lesson in the American health-care system. If you have schizophrenia there and need an anti-psychotic, but can’t afford medical insurance, you are simply left to struggle for your sanity. Needless to say, from that point on I sourced my medication from Australia. I guess the only dark aspect of my time in NY was my occasional bouts of depression. I remember lying in bed for hours; walking around Greenwich Village in the cold trying to perk myself up with exercise; talking to Mum on the phone for stretches at a time. I guess the problem of depression and anxiety is still with me, though as we will see, I have adopted certain strategies to contain these feelings. 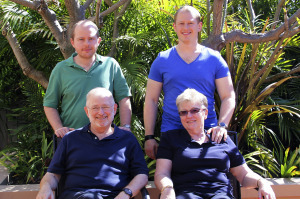 Richard Schweizer with his brother Marcus and parents Sonja and Norbert at home. I returned to Australia in 2005 and decided to do a Masters, in either Fine Arts or Journalism. My parents thought the latter was a good idea, so I went with it and enrolled part-time at the University of Technology, Sydney. I enjoyed the degree, although I earned a Pass mark in one course – the only time it has ever happened to me. It was around this time that I decided to become a patient ambassador for the Schizophrenia Research Institute; a voice for people with schizophrenia. I had always had good public speaking skills, and I felt that the issue needed to be discussed; that my strong recovery and participation in life may give hope to some who were struggling. There was also a deeply personal reason for “coming out” as a person with schizophrenia. I wanted to turn what was the worst thing in my life into one of the better, if not the best thing in my life. I also felt, in my moments of despairing depression, that holding on to a sense of purpose, of something bigger, helped me deal with dark feelings. Maybe, like my behavior as a child, I wanted to be Superman again – though this time the Superman of a broken mind. I knew I would face difficulties. I knew I would have to open very personal parts of myself up to public scrutiny. I knew there would be stigma. But it has turned out to be one of the best decisions of my life. I feel energized when given the chance to tell my story. I appreciate the fact that people come up to me after hearing me speak and tell me of their own struggles with mental illness, or the struggles of a friend or relative. I feel like I am on a mission – a mission to help de-stigmatise schizophrenia. Hence the message I wrote at the beginning of this blog: schizophrenia is normal. I had finished my Masters in Journalism and felt at a loose end. I asked my father one day: “Do you think I am capable of doing a PhD?”. He replied, emphatically, “Yes!”. I needed his approval, and got it. I enrolled to do a PhD in Sociology part-time at Sydney University. I knew I would need to write on a topic that I felt was important to me, and important to others. It seemed natural to write about schizophrenia. Again, I was turning one of the worst things in my life into one of the best. That was five years ago. I have come so far since then. I have interviewed a dozen people around the state about their struggles with schizophrenia. I have read countless books, some personal, some scholarly, on the nature of schizophrenia. I have written – oh how I have written! At the time of publishing this blog I have completed a methods chapter, three theory chapters, three results chapters and a discussion. I am also sitting on the fourth draft of my Introduction. I hope, in a month or so’s time, to have a complete first draft of my thesis. I have an excellent supervisory team who understand my special concerns, who respect the work I do, and who give honest feedback. I have enjoyed the process greatly. Well, there’s always further to go. I would like to find a partner, to marry, maybe have kids. I still have to move out of home (yes, I know – thirty-three years old and still at home! ), I have lovely parents. I am proud to have made contact with dozens of people with mental illnesses of their own. I have been on anAustralian Story episode with my learned friend, schizophrenia researcher Professor Cyndi Shannon Weickert from NeuRA. My father and I appeared in a Two of Us article for the SMH and I was recently interviewed for an episode of All in the Mind on Radio National as part of Mental Heath week. I have talked at conferences and seminars. I am hoping to have the opportunity to talk at my old school. I present a community radio show on Eastside Radio, 89.7 fm (have a listen!). I play bass in a band called Crash Through. Once I finish my PhD I would like to work in the field of mental health policy. Not bad for a man who once contemplated the darkest of thoughts in the midst of psychiatric torment. 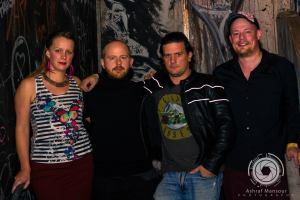 (L to R) Members of Crash Through. Alicia Nagle, Richard Schweizer, Tim McAlpin and Phil Morgan at the Metro Theatre in Sydney. And finally, perhaps the most important thought. Mental illness is normal as I suggested in Part 1. Schizophrenia is normal. We can no longer treat people with schizophrenia as outcasts; as lepers of the mind. Perhaps we may alleviate some of the suffering people with schizophrenia have and will face in trying to live their lives if we view the disease this way. People with schizophrenia must be welcomed back into the fold of society. They need understanding and acceptance.